The Akshaya Patra Foundation had the pleasure and distinction of celebrating the serving of 2 billion meals, in the presence of Shri Pranab Mukherjee, Honourable 13th President of India. The event, held on August 27, 2016 in Bengaluru, was attended by numerous other distinguished dignitaries, including Shri Prakash Javadekar, Honourable Union Minister of Human Resource Development; Shri Siddaramaiah, Honourable Chief Minister of Karnataka; Shri Vajubhai Rudabhai Vala, Honourable Governor of Karnataka; Dr Murli Manohar Joshi, Member of Parliament, Former Minister of Human Resource Development, and Science and Technology; Worshipful Mayor of Bengaluru, Shri BN Manjunath Reddy; Member of Legislative Assembly, Mahalakshmi Layout constituency, Shri Gopalaiah K and Mrs Sudha Murty, Chairperson, Infosys Foundation. The event was presided by Shri Madhu Pandit Dasa, Chairman of Akshaya Patra; Shri Chanchalapathi Dasa, Vice Chairman of the Foundation and Shri Mohandas Pai, Independent Trustee of the Foundation. 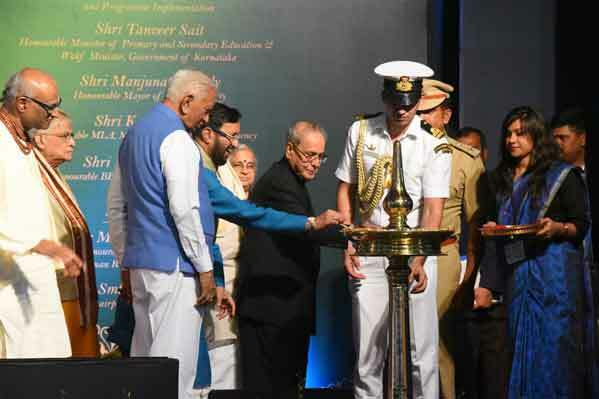 The festivities which began with an invocation prayer by St Joseph’s Convent School choir and the ceremonial lighting of the lamp by Shri Pranab Mukherjee, witnessed inspiring speeches from the dignitaries present on the dais. Shri Madhu Pandit Dasa traced the journey of Akshaya Patra that led the Foundation to this important milestone, which has benefitted millions of children in India with its free mid-day meal initiative. Shri Pranab Mukherjee commemorated the landmark event by unveiling the 2 Billion Meals art installation and a symbolic distribution of sweets among the Akshaya Patra beneficiary children. View more images here.